A relatively new sweet to jump on the dessert trend bandwagon is the scroll. Soft pastry, layered with scrumptious filling and rolled up into a perfect snack-sized portion. Many places boast the best scrolls, but which one is your favourite? 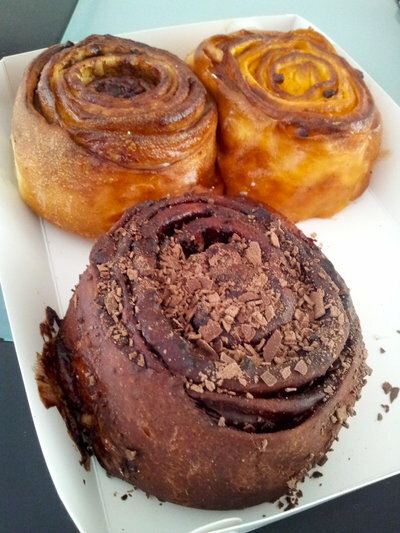 Hands down, the best scrolls have to be the ones at Oregano Bakery in South Hurstville. Almost because of its cinnamon scrolls alone, this place has gone from a tiny bakery to a proper sit down cafe, and now distributes its scrolls to other restaurants and companies. The scrolls now range from cinnamon, to nutella, to orange and macadamia, with many other yummy flavours in between. Dig anything scrolly from the Bourke St Bakeries, although surprisingly the offers from Baker's Delight are great too! I love to grab a little lemon cream cheese scroll for $2 on the way to the train station after work. That French patisserie in Paddo that used to be called Bread of France (right near the Paddington Inn) is a great contender. Macquarie Shopping Centre also sells great pastries such as snails at their cafes, and I have love them at Narwee Bakery. They're generous with the sultanas there. Oregano all the way. If you know them, you can spot them in other cafes around town. I can't indulge in scrolls (gluten), but like to grab one sometimes for my husband when I'm at Baker's Delight. Like Ally L said, they're well priced and surprisingly good, plus there's pretty much always a Baker's Delight somewhere nearby.